Photo courtesy of Bartholomew County Sheriff’s Department. 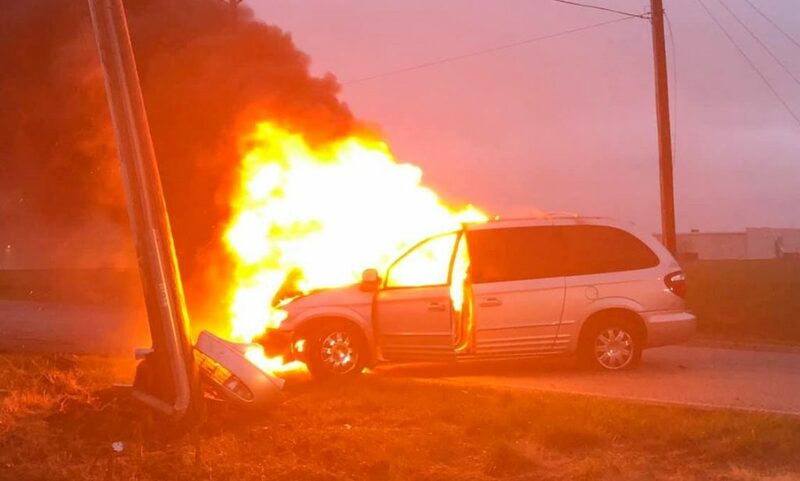 Emergency officials say that a van struck a power pole last night, knocking out power to parts of northwestern Bartholomew County and setting the vehicle on fire. The crash was at County Roads 800 N and 250W at shortly before 9 last night..
Bartholomew County REMC reports that it was a Duke Energy pole that was knocked down, but the line provided power to the Taylorsville substation. The energy co-op said it had to reroute power to restore electricity to many customers last night, until the pole could be replaced. Edinburgh and German Township firefighters fought the vehicle fire. As of this morning, REMC was reporting no outages. There is no information available on the driver of the vehicle.